The score is the thing . . .
My first full season as an 1. FC Köln fan started with plenty of matches where the Billy Goats dominated in virtually every measurable statistic excepting the only one that counts, so I’m not going to spend too much time feeling regret or concern that these three points were not delivered in the most-dominating style. On the other hand, I don’t think you could say our guys were badly outplayed, either. Dortmund maybe had more of the really good plays on the day, but they also dominated in the number of incredibly poor plays, too. For every nice move or pass by Shinji Kagawa or threatening play by Marco Reus, there was a poor pass from any of a number of dudes also wearing road construction safety gear maquerading as football uniform. Henrikh Mkhitaryan and Ilkay Gündgoan, in particular, were surrendering possession on a regular basis. I don’t know why Borussia Dortmund is doing quite well in Europe while struggling so mightily domestically, but nor do I care. I’m simply happy their woes were able to extend another match day. It really felt like the scene was set, with the international break as a natural transitioning time, for the BVB to return to their typical dominant selves at the hands of a promoted side. It just seemed like it was how the story was meant to play out. 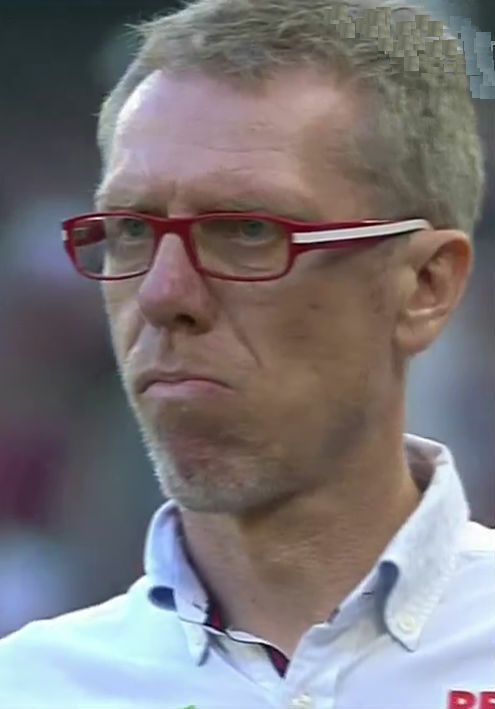 That’s where you have to completely love Peter Stöger’s utter disregard for anyone else’s expectations. He’s the football manager and will take care of business the way he sees fit. Now, before we have our Friday kick-off in Bremen, please allow me to run through some other thoughts from the happy-making victory over Dortmund. Dominic Maroh was out with the flu, so Mergim Mavraj started in his stead. Pawel Olkowski was in Miso Brecko’s place for the second-consecutive week. Jonas Hector and Kevin Wimmer? They do not get supplanted or sick or anything else. You hear me, fellas? YOU STAY HEALTHY! Nothing new in goal or among defensive midfielders. Timo Horn, Kevin Vogt, and Matthias Lehmann were all where you would expect them to be. Further forward, things were more interesting. Marcel Risse was on the right flank, but Daniel Halfar was moved to the middle so Dusan Svento could make his debut along the left side. All alone at the point of the spear? Simon Zoller?! Okay coach. You’re the boss. Why was there so much yellow in the stands? That doesn’t look right. Too much yellow. Not just in the visitor block, but throughout the stadium in general? I’ve seen enough complaining on Twitter at the inability to secure tickets for this match due to issues with the ticketing system to know there were plenty of proper Effzeh fans wanting to attend the match. Is a little bit of fiscal profit worth knowing you played a role in letting the stadium look like that? It was a bit shocking. I am well used to Köln fans going on the road and being louder than the home crowd. I never imagined the home stands would be so thickly populated with interlopers. EVER! If you want to take a friend who’s a Dortmund fan, I get that. There are plenty of good reasons why there might be a few Dortmund supporters mixed among the sell-out home crowd. But it shouldn’t ever be that visible. Not on Müngersdorfer soil. Someone take care of this! He plays = no goals. He is replaced = goals. This would be an overly simplistic way to look at what’s happened in attack, but it’s hard to get past it. I had issues with Zoller’s play in Frankfurt. I still had some from this match as well, but have to concede that he did a few things well. Things at which our Tönn had not been as successful so far. Zoller’s runs, when he made them, were better timed than the ones that had Ujah offside seemingly a dozen times the last few matches. Zoller also won a ball in the air, something we weren’t getting from Ujah. Because the long ball over the defense seems to not be going away, we have to have a striker who can bring it down and make something happen. Zoller did exactly that, even with World Champion Mats Hummels trying to defend. The shot went wide, but it was a very exciting play finished with a strong shot that could have been trouble for the BVB. As I mentioned in the player ratings, Zoller appeared to put a head fake toward the ball as it arrived from a Yuya Osako cross with Roman Weidenfeller charging off his line. 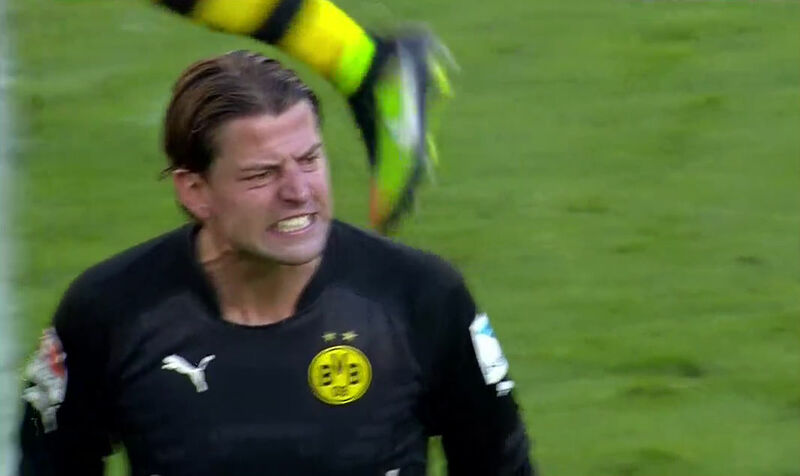 I think Weidenfeller was forced to hesitate for a moment, which caused him to miss playing the ball, giving Zoller the easiest goal he’s likely to score anytime soon. It LOOKED like a super-savvy play. Whether it actually was, I have no idea. 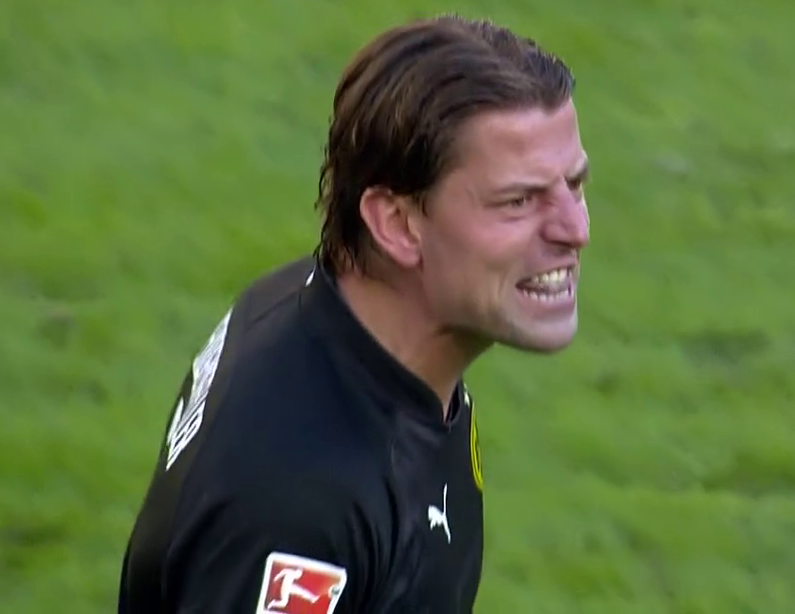 For all I know, Weidenfeller just whiffed. I’m preferring to think Zoller is sneaky. You are free to think it however you want. Regardless, I’m not done wanting to see Ujah playing a major role in the Effzeh attack, so I hope the coach agrees. You have to say that, with someone like Robert Lewandowski up front and maybe a Mario Götze type in the midfield, this would be a crazy offense to try to stop. Someone with loads of money figured that out, of course, and assured that would never again happen. At least not in Dortmund. Kagawa and Reus were a treat to watch. Or . . . rather . . . they would have been a treat to watch if their play wasn’t giving me constant heart palpitations. Reus was simply off-target for the most part, but he got his chances. Kagawa was nearly impossible to contain, which is probably why he was never a fit for English football. sidebar: I know nothing about English football other than they seem to be less than their reputation in both club and country competitions, but how they’re too talent-rich to put a player like Kagawa to good use is insane. Anyhow, the flow pretty much stopped with those two guys. Ciro Immobile scored, but only because Mavraj made a pair of bone-headed decisions. Otherwise, the Italian Reus (they don’t really look that alike, except to me) seems unable to find his place in the attack. And Mkhitaryan, as I said on Twitter (much to the chagrin of a pair of Mkhitaryan apologists, by the way), seems to play like a disaster whenever I watch the BVB play. Saturday, nearly every pass he made went to someone in red and white. By 20 minutes in, he was a source of laughter, not a threat. He did crank one shot off, but in that offense, getting one shot to go wide is hardly an accomplishment. Real ballers don’t beg for calls with poor dives, yo. Oh, add to the list of Mkhitaryan misdeeds the absurd dive he made outside the area. It was egregious and obvious, hence earning a yellow card. Even after he was busted, he tried to play as if he had been wronged, which is simply not manly or sporting or anything else. That goes for you, too, Gündogan. You did not get his in the face, at least not where you clutched and went down as if you’d taken a shot from Mike Tyson himself. And then, as play is stopped for you to recover after not getting the call, you are still rubbing your jaw as if you’d been struck? Except now you’re rubbing the other side of your jaw! The one that couldn’t possibly have been struck! You forgot which side of your face you were pretending to have been hurt in the span of just a few seconds? Happy Pete says . . . nothing. Stop trying to make cursive “Borusse!” happen. It’s not going to happen! This ugly sweatshirt has to go. I mean, aside from needing to continually refresh the fan shop with new merchandise to peddle to those fixing to stand as part of the yellow wall, how did this make it all the way to “Let’s go with it”? 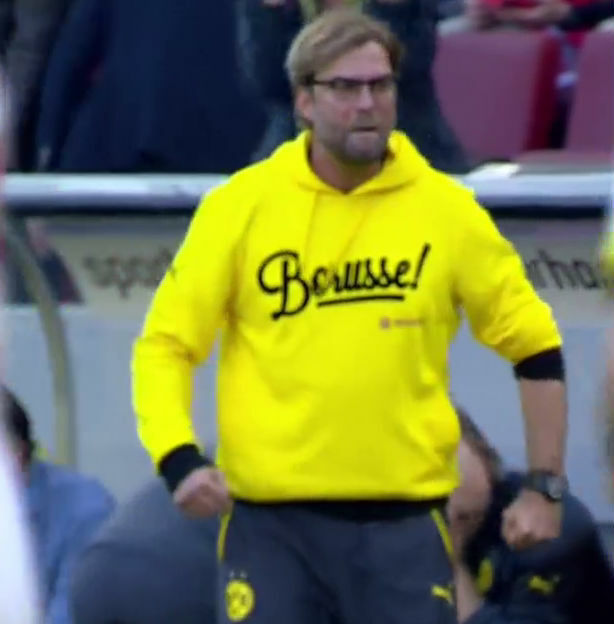 Bright yellow sweatshirts are tough as it is, but a cursive font screaming “Borusse!” isn’t really helping. You have “BVB.” Let’s be honest, the “BVB” is a cool set of letters to have as an emblem. Hell, if I remember almost nothing from attending my first ever football match, I could never forget how often “Bay Fow Bay” was yelled, sung, and chanted. 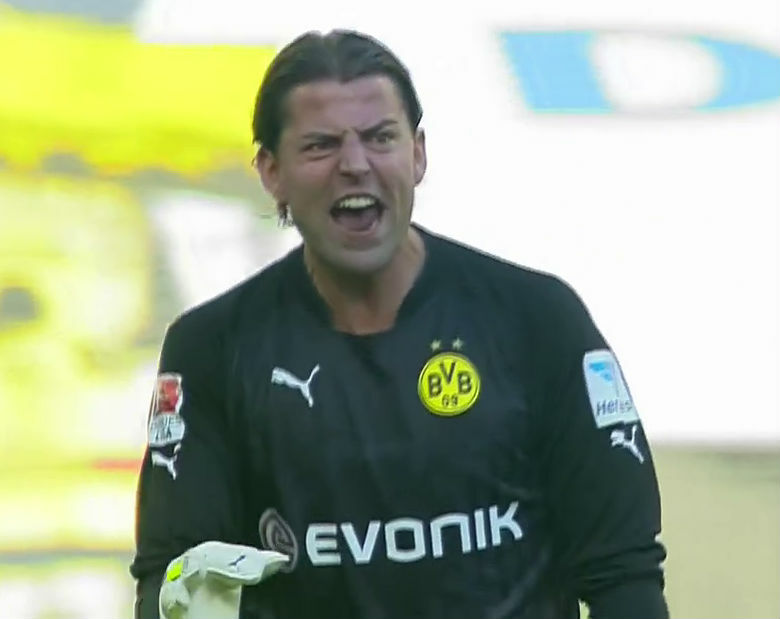 Big, blocky, black “BVB” on the front of that shirt would get it done. And then you can bury that shirt with the “Pöhler” trucker hats that never seemed to take off. Be the first to comment on "Match Day 8: 1. FC Köln vs. Borussia Dortmund"